Just a short drive from San Francisco to the north and across the foggy hills ("Some people say it's all the rice cooker steam," explained my trip companion, Kim Arteche, jokingly) is San Rafael, a town founded by Spanish priests in the 1800s and is the seat of Marin County. While there is a sizable Filipino community in the North Bay, it has often gone unrecognized. At Dominican University, Remythologizing Filipino Archetypes: 50 Shades of Kayumanggi gives the spotlight to the Filipino American community and is the most comprehensive art exhibition featuring Filipino American artists that has been shown in Marin. Artist and curator O.M. France Viana met us at the gallery to give us a tour. O.M. France Viana, selections from "50 Shades of Kayumanggi." 20 diptychs. Digital print on vinyl mounted on panel. The Tagalog word kayumanggi, which has no English equivalent, refers ambiguously to Filipino skin color; a shade of brown that cannot be precisely located on a color spectrum. Various Tagalog-to-English dictionaries attempt to define kayumanggi as "color like coffee," "brown skin," or simply "brown." In her diptychs, Viana unpacks connotations of gender, class, and race in a number of shades of brown that could be considered kayumanggi by juxtaposing colors such as "peaches and cream" with descriptions such as "film star," or "light taupe" with "mestiza de entresuelo." During our visit, Viana explained the meaning of entresuelo, a mezzanine, or "between floors." 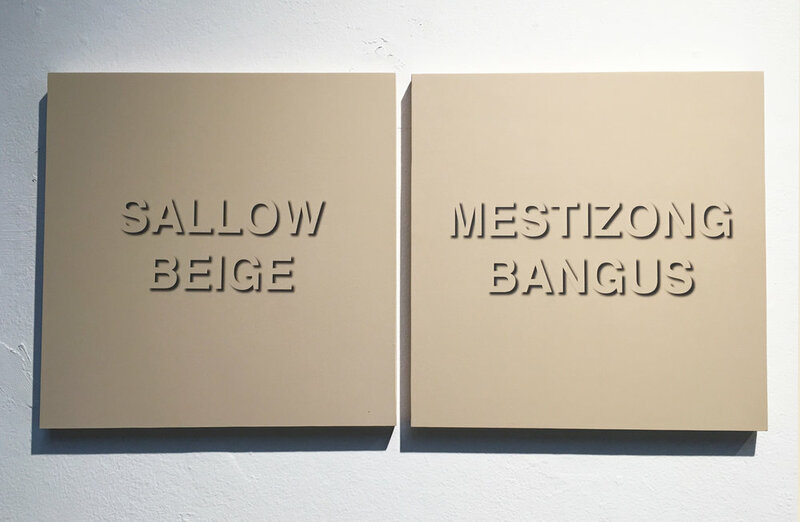 The phrase translates literally to "half-breed in the mezzanine"—a deprecating term that points to the complicated relationship between identity, brown-ness, and belonging that continues even long after Spain's colonial rule. Further exploring the idea of kayumanggi and archetypal Filipino figures such as beauty queens, nurses, and overseas workers, the exhibition features 14 Filipino American artists, guest curated by Viana, which include Michael Arcega, Kimberley Acebo Arteche, Francis Calimlim, Cece Carpio, John Yoyogi Fortes, Mik Gaspay, Rea Lynn de Guzman, Johanna Poethig, Sherwin Rio, Lordy Rodriguez, O.M.France Viana, Pamela Ybañez, Catherine Wagner, and Jenifer Wofford. Each of these artists confronts these Filipino archetypes by deconstructing and reinterpreting their mythologies. It is important to look for the visual puns in this show. 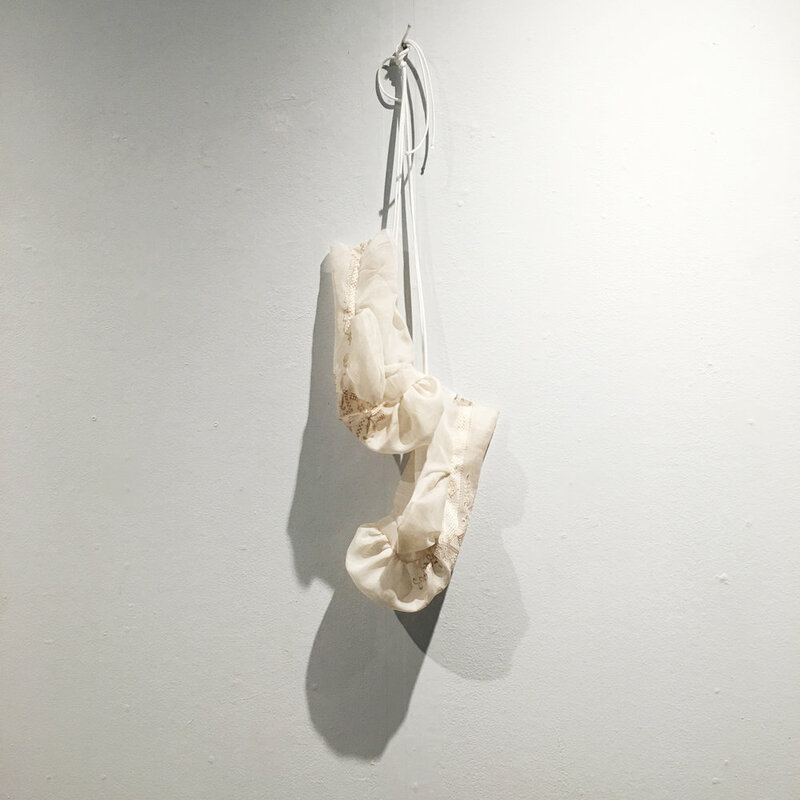 In pieces such as Michael Arcega's "Doña Señorita (Matriarchal Power Enhancement)," a veiled figure is evoked. In Spanish, the double honorifics doña and señorita might seem disparate, as doña may refer to a prominent married or widowed woman who might don a veil, while señorita may refer to a woman who is young or unmarried. Who is underneath the veil? With a closer look, it's revealed that Doña Señorita is in fact a veiled bunch of Señorita bananas, a sweet type of banana from the Philippines that is miniature compared to its counterpart eaten in the United States. Francis Calimlim's piece, "Ba Bared Backed Wrong," punning on the word barong, is a wall drawing that depicts a barong worn backwards; the front of the garment worn on the wearer's back, suggesting a vulnerable side to the macho male stereotype. Michael Arcega, "Doña Señorita (Matriarchal Power Enhancement)." Ceramics, steel, wax, fabric, crystals, and mixed media. Pamela Ybañez and Sherwin Rio also bring forth associations with the traditional garment the barong tagalog. Ybañez's piece set on an embroidery hoop evokes women's work and the often invisible labor of sewing the intricate designs for the men's garment. Rio's barong, dyed black and hung on a clothesline, counters the invisibility of the piña fabric that is almost transparent. Another piece of Rio's, boxing gloves made from a barong, suggests the inherent power it might give the wearer. (left) Pamela Ybañez, "Barong Hoop." Barong shirt in hoop. (right) Sherwin Rio, "Gloves." Embroidered piña jusi, silk thread, nylon. Several other pieces invoke the important figures present in Filipino life and imagination—the manong, in John Yoyogi Fortes' mixed media paintings "Manong Bob" and "Bibiano," the OFW (overseas Filipino worker), in three oil paintings by Johanna Poethig, and nurses, in Jenifer Wofford's drawings "observer nurse" and "pushback nurse." The 14 artists in this exhibition present an important look into what it means to be Filipino in the context of the Bay Area and abroad, in 50 ways and more. Join the artists for a reception on August 30 from 5-7 PM at Dominican University's Alemany Library Community Gallery. The exhibition runs through September 15.